Reserve Bank of Zimbabwe Governor John Mangudya. The Reserve Bank of Zimbabwe (RBZ) has created a special window to plug liquidity challenges being experienced by commercial banks as part of a raft of measures the central bank has put in place to address recent concerns raised by financial institutions, businessdigest can report. The "special window" will see the central bank resuming one of its core duties of being the lender-of-last-resort, more than a decade after abandoning the responsibility when the country adopted the use of multi-currencies in 2009. A lender-of-last-resort is an institution, mostly a country's central bank, that offers loans to banks or other eligible financial institutions that are experiencing financial difficulty or are considered highly risky or near collapse. 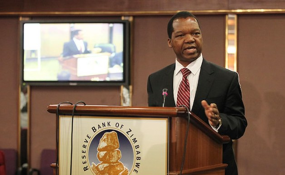 Commercial banks tabled their submissions before the presentation of the Monetary Policy Statement (MPS) last week by RBZ governor John Mangudya who has since liberalised the exchange rate through the creation of an inter-bank forex trading platform. Mangudya last week abandoned the fixed exchange rate policy that saw the bond note maintaining a 1:1 par rate against the US dollar for a managed floating forex management system and introduced a new currency called the RTGS dollar, among other measures. Businessdigest can exclusively reveal that banks, grappling with mounting costs after awarding their employees a 42% cushioning allowance, submitted a proposal to the central bank seeking an upward adjustment of transaction charges, among other submissions. According to the proposal paper submitted by the Bankers Association of Zimbabwe (Baz), seen by businessdigest, and addressed to RBZ governor John Mangudya, local banks recommended an upward review of bank charges, interest rates, scrapping of the multi-tier pricing system and creation of a robust money laundering countering mechanism, among a raft of proposals. Through the correspondence dated February 15, commercial banks were also seeking an upward review of interest rates. Earlier this month, Baz officials met with their counterparts from the apex bank and expressed concern that the 42% wage increase was eating into their income, while transaction charges remained stagnant. Mangudya confirmed to businessdigest last week following his announcement of the MPS that commercial banks had tabled various submissions and that the apex bank was assessing the proposals. "We met the banks on Wednesday (last week) to go through their submissions. So the banks made their submissions which we considered almost in total. They want the removal of distortions in the market, the removal of the multi-tier pricing system, money laundering and countering mechanism as well as bank charges and interest rates. And our response, which is very clear, is that we have taken their submissions positively," Mangudya said. "What we now need to do is to establish an accommodating window at the central bank for the banks. This is to accommodate banks' requirements for RTGS money when they are in short supply of money. That window, as you are aware, will come with something called a bank rate at the appropriate time. So when that bank rate is established it will permeate into banks. We are receptive to their submissions." Productive loans attract 12% interest per annum. The static interest comes against a background of a rising rate of annual inflation, currently officially computed at 56,9%, although leading American economist Steve Hanke says it is way above 230% that has eroded purchasing power. Bankers fear the failure to tame inflation could threaten the viability of the financial services sector while the absence of a "healthy" lender-of-last-resort would imperil distressed banks. Prior to the announcement of the MPS, inflation was primarily being fuelled by the weakening of the bond note against the United States dollar that has seen retailers adjusting prices in line with the parallel market rate. The central bank created a huge stock of electronic money, issued Treasury Bills (TBs) and other instruments, clocked up massive domestic and foreign debt and ran a current account deficit, resulting in the weakening of the bond note. In light of rising costs, commercial banks felt they could cushion themselves by revising income lines in the volatile economic environment.